For those still smarting from the post-Crisis creation of alternate universes and wary of even more convolution to come from the current Flashpoint miniseries, DC Comics has a drastic solution in mind: It’s restarting every one of its major titles at Issue #1 this September, instituting a dramatic renumbering of its catalog to bring in a new audience who doesn't have the time or patience to learn all about Earth-2 and so on. DC made the oft-rumored reboot official today with an announcement saying that not only would August 31 mark the beginning of same-date print and digital publishing for the company, it would also see the publication of both Flashpoint’s final issue and Justice League #1, which will apparently pick up whatever is left of the DC timeline and carry on from there. 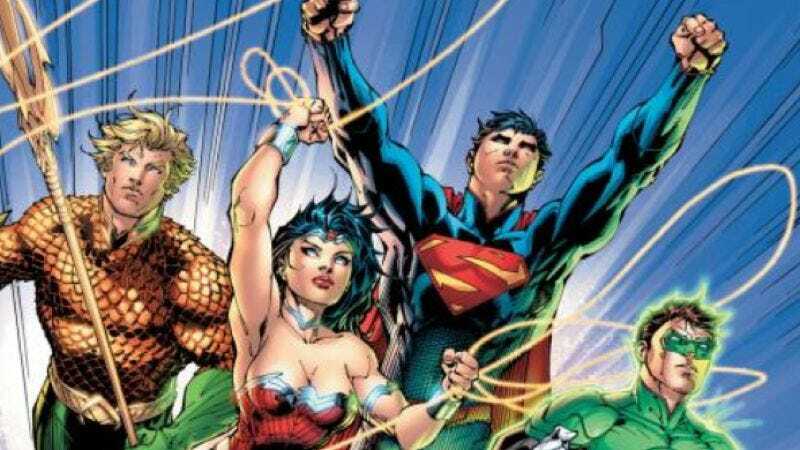 According to DC, the reboot will provide “a contemporary take on the origin of the comic book industry's premier superhero team,” an updated version that will incorporate co-publisher Jim Lee’s costume redesigns that will “make characters more identifiable and accessible” to a younger audience, like when he took Wonder Woman shopping at Forever 21. Presumably it will also retell the story of how Superman, Batman, Green Lantern et al. got together in the first place in a way that the kids can relate to, such as having them all meet up through the “People You May Know” finder on Facebook.